This time of year many of us begin to get our financial information together for our taxes. Getting your finances organized can seem like a daunting task. There are several tools that can help you keep track of your finances in 2012. If you are looking for an organizational system, here are some suggestions. Keep track of expenditures using a computer management program. There are a number of programs available. Look at different ones on the internet until you find one that suites your needs. If you are not ready for computerized record keeping, an accounting book, bought at any office supply, will do. For financial papers, try a monthly expandable file. This allows you to keep all important records in a single place. These records can be accessed easily at tax time. If you own a scanner, after your taxes are done, original records may be scanned and the original disposed of. Do NOT disposed of the originals of any TAX documentation, as it could be needed for an audit. Any scanned records should be backed up, on a separate drive, which should be kept at a different location from your computer. If you have an accountant or other financial professional, ask for help in setting up your record keeping system. 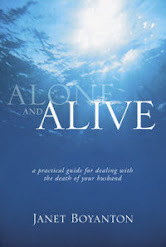 To help you get organized I am offering one lucky reader a copy of my book, Alone and Alive,a practicle guide to dealing with the death of your husband, and a $25 Staples gift card. To enter follow the directions below. 1. Sign up to follow my blog through Google or by email. 2. Leave me a comment telling me your best organizational suggestion,that you are following my blog, and your email so I can notify you if you win. 3. Current and new followers are eligible to enter. 4. Only one entry per person or email address. 5. Open to United Stated residents only. 6. Dead line to enter is 11:59 p.m. CST April 15, 2012. 7. Winner will be contacted by email and will have three (3) days to claim their prize.